If you’re shopping for custom baseball pins, you’ve come to the perfect spot! TradingPinsDirect is your one-stop source for great looking trading pins, affordable prices and fantastic customer service! TradingPinsDirect is your source for awesome softball pins! Our artists work with you to create fantastic looking pins that will showcase your team spirit and trade well at the big game! We have the perfect way to protect and carry your custom trading pins. 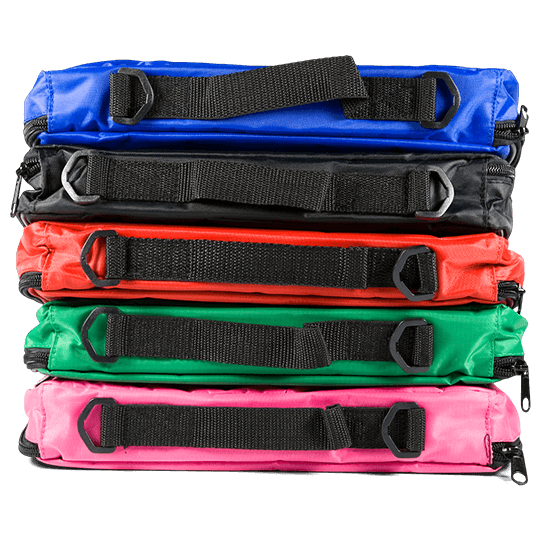 Our attractive, durable trading pin bags are great for taking your pins to the big game or tournament! We know you’ll love our trading pins and we guarantee it! With over 10 years of manufacturing quality custom sports pins and spirit pins for teams and events around the world, we are confident that you will love the quality of our trading pins, our industry-low trading pin pricing and the unmatched level of service our dedicated staff provides! Not quite sure what you want? No problem! Just fill out our quick quote form, and we’ll respond promptly to help you decide. We respond within 24 hours or less with details about pricing and suggestions for your pin design. We’re always happy to help, and there’s no obligation at all. Carry Your Pins In Style! Once you have your pins, you’ll need a way to safely carry them to games and trading session. We’ve got you covered with great-looking custom pin bags. They feature cloth sleeves to keep your pins scratch and scuff-free, and can be customized with stickers, sew-on patches and more. We can help! 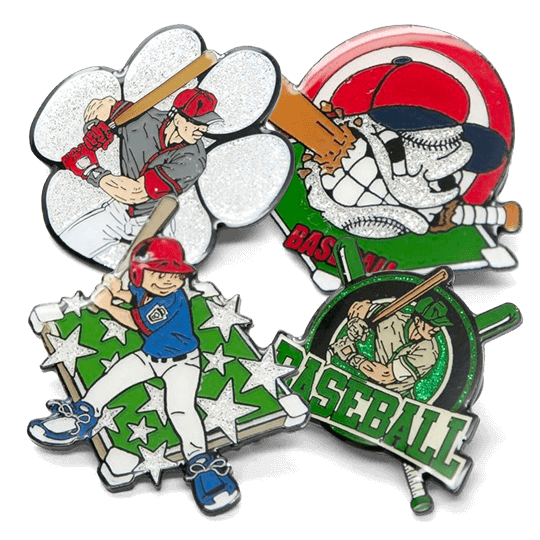 We have a range of stock baseball and softball pins that we can ship quickly to prevent your team from being left out of the trading fun. If the tournament date changed, or your team qualified late, we’ve got you covered with stylish pins and expedited shipping. Details, Details, Details! Providing our art team with your team name, logo and colors, is the most vital part of designing a custom pin that will best reflect your team or organization. Additional details such as city/state location, age group and tournament name add more depth. The more details you give our graphics department, the more accurately they can capture your design within the first couple of proofs, saving you time and expediting the start of production. Beware Too Many Cooks! Trading pin veterans recommend limiting the number of people who have input in the designing process to 2 or 3. If each of the players, coaches and parents vote for pin designs or revisions, not only can it lead to infighting, but many teams become so bogged down in arguing over designs that they run out of time to actually receive their pins by their event date! Good Art Makes Better Pins! Obtain the highest quality versions of any team logos or artwork prior to starting the design process. Vector art always makes better designs. Watch Your Size! Create a circle the size your pins will be, and make sure any text or details in the pin will be visible at arm’s length at actual size. Watch Your Colors! Try to keep your design to 7 colors or fewer. Additional colors can add cost and time to your custom trading pin order! Less Is Usually More! The most striking designs generally contain large mascot or logo images as the main focal point of the pin, with team name and location coming in a close second. Keeping a “minimalist” approach and only including the most relevant images or information will allow the design to appear much more colorful and clean-lined. When in doubt, leave it out! Trying to shoehorn too much info into too small a space will result in unreadable text or fine lines not translating clearly during the production process. We advise a 1.75″ or larger size to include the team’s uniform numbers, and at least a 2″ size if using player names. Know your colors! Our pins are colorized using the Pantone Matching System, which is a print industry standard color guide. Viewing digital proofs on a computer monitor will give you a representation of the pin’s colors. However, because monitors differ in their display properties, the only way to truly ensure the colors match your team’s uniforms is to refer to a Pantone Coated Color Guide. These can be found at many art supply stores or within the reference section at public libraries. Many colors are subjective! The interpretation of “burgundy,” “teal,” “purple” and many other colors can vary widely from one person to the next. Check your art proof closely to make sure the Pantone colors used match your team’s version of that color! Again, the absolute best way to verify this is to match your team’s uniform against a physical copy of the Pantone Coated Color Guide. Consider the metal color! The base metal style used on your pins plays a huge role in how the finished design will look. A good rule of thumb is to stick with the most common dyed-black metal if your pin contains a mascot or sports player. That’s because facial details do not translate well to the high-polished look of a silver or gold metal pin. Alternatively, if your team colors are dark (navy, red, black, etc. ), a silver pin will keep the raised metal in detail lines and text from disappearing into the background. Know how size is measured! The easiest way to determine a pin’s measurement is to create a circle with the same diameter as the desired pin size. Then expand the pin design until two points opposite each other touch the edge of the circle. Contrary to common belief, pins are NOT MEASURED TOP TO BOTTOM, LEFT TO RIGHT! We include a measurement ruler on each digital proof. However, this is still the most often overlooked aspect of many customers’ designs. Make your pin size work for you! If you are using player names and/or numbers, you will need a larger pin than a pin which contain just a simple mascot, team name and location. While a 1.25″ size will be the least expensive, this size will greatly limit the amount of information and detail which can be included. More detail equals more work! With die-struck pins, 95% of the enamel pin coloring is applied by hand. As you can imagine, lots of small nooks and crannies with multiple colors will take longer to fill if a small pin size is used. A realistic bird mascot with detailed feathers is a good example of a pin that will benefit from a larger size, compared to a cartoon bulldog mascot which contains larger open areas with cleaner lines and less fine detail. Metal is as metal does! Each of our custom trading pins is created from a metal base. The ability to capture detail depends on the pin style you choose. A die-struck design will show less fine detail than an offset digital pin. If your logo has extremely small detail or text that is not easy to view when enlarged on your computer monitor, you can expect that a metal pin at actual size will not contain the same level of detail. Beware Too Many Options! Pin options are exciting, and add a definite flash to most pin designs. That said, if too many options are used, they can overwhelm the core elements of a great pin design. Bear in mind that a slider option, for example, must have a path cut out across the body of the main pin. A 1/2″ spinner or slider on a 1.5″ pin would cover 1/3 of the surface area of the pin. A blinker light requires a battery pack which will be visible around the outer edge of a pin smaller than a roughly square shaped 1.75″ pin. Know your budget! When deciding how to design their pin, many teams select multiple options such as danglers, blinkers and glitter. That can price some team members out of participating in the pin trading activities. Not only does this prevent some team members from being able to trade pins, but lowering the number of pins ordered also raises the per-piece rate for the rest of the group! Glitter Can Be Great! Our most popular option is, not surprisingly, the one which provides the most bang for the buck. Glitter is only 12 cents per pin for each color used. The ideal use of glitter is on a darker color in the background area of the pin. This allows a wider area for the glitter to catch light and shimmer, while causing the solid-colored mascot or team name to be pushed to the front and really pop off the pin. When you’re shopping for your pin trading needs, you want to make sure you get trading pins your team will be proud of, the best value for your money and the most positive buying experience you can get. Despite what some companies may tell you, selecting the right trading pin supplier DOES make a difference. Fortunately, it’s not hard to find a good company. With just a little bit of research, it’s easy to find the right trading pin supplier for your team. You’ll find TradingPinsDirect is your best choice for all your trading pin needs. Look for a company that’s been around for a while. Any reputable custom trading pin company will have a track record. Any company that’s been around for five years or more has been in business long enough to develop a reputation for quality work and customer satisfaction. And that track record enables them to attract talented artists who really know their stuff. Sure, you could choose the company that’s only been on the Internet for a month or two – but do you really want to do that? Ask about the artwork. A great trading pin supplier have an experienced, talented group of artists who will help you design your trading pins until they’re exactly the way you want them. And they’ll never charge you for artwork or revisions. Look for “no surprises” pricing. Everything should be quoted upfront. You shouldn’t have to worry about any fees for artwork, revisions, setup or shipping. Trading pins are available in multiple styles, with one sure to fit just about any trading pin budget. A good pin supplier can advise you on which pins will give you the most “bang for the buck” in terms of trading power. A company that can provide any trading pin style from soft enamel to offset digital, photo etched or silk screen printed pins will have the flexibility to provide the best pins for your team. TradingPinsDirect is the foremost supplier of custom trading pins in the United States. We are dedicated to total customer satisfaction. If you want the finest trading pins you can get, at the best prices, give us a call toll free at (866) 860-8842 or email us at [email protected] today. We’ll be happy to help you create the pins that everyone at the next tournament will want to trade for! ORDER EARLY! Every year, teams across the country miss out on pin trading because they wait until the last possible moment to place their orders. We cannot stress this point enough. During June, July and early August, every pin factory in the world is backlogged due to the incredible amount of pins being ordered in such a short period of time. If you know your team is attending a tournament, it is in your best interest to order your pins at least a month in advance. Better to have the pins underfoot for several weeks than to anxiously hope they arrive in time for pin trading day while surrounded by unhappy players! Make Sure Everything Checks Out! Before finalizing your order, take one last look over the size, quantity and final artwork proof. Once an order is underway, we cannot make any changes to the pins. It is very important to check the spelling of names and cities, the colors selected for the pin, and the number of pins you are ordering. We Are Here To Help! Each year, as Youth League baseball and softball tournaments begin, our staff turns away tens of thousands of dollars from teams who do not have a chance of delivery by their event date. We work very hard to be as upfront as possible concerning the projected turnaround times we receive from our various production facilities. We will gladly advise any ways to help increase the odds of meeting your event date on late orders. We strive to be as accurate as possible on time frames and recommendations. Please understand, however, that custom-created items and third party shipments contain so many variables that we simply cannot offer a delivery date guarantee during the June through August tournament season. Once again, the best way to ensure your team has pins to trade is to order early! Check Us Out! Our parent company, TJM Promos, Inc. is one of the largest promo product suppliers, and TradingPinsDirect is one of the largest custom sports pin suppliers in the industry, and we pride ourselves on dealing honestly with each and every customer. We don’t believe in sacrificing potential long-term relationships for a quick sale today. Unfortunately, many of our competitors do not feel this way. Around May every year, small company sites crop up across the web offering whatever cut-rate deal or turnaround guarantees they need to promise in order to get your business. Many of these companies either have no intention of keeping their word or lack the necessary resources to cope with the amount of business they receive from these unattainable advertisements. Count On Us! We’ve been here for more than a decade. We take pride in our repeat business from loyal customers. Take 10 minutes to check the Better Business Bureau or do a little research into a deal that sounds too good to be true. When you’re ready for an honest deal that can save you and your team weeks of frustration and lots of your hard-earned money, we’ll be here!